InSanity lurks Inside: Why the Busch Gardens Parks are NOT going anyplace..
Why the Busch Gardens Parks are NOT going anyplace.. If your out there on the internet and stumbled upon some of the "Doom and Gloom" crowd, I'm sure you've seen the folks crying the downfall of these parks. Oh yes, the sandwich boards are out of the closets and people are screaming "the end is nigh" from the rooftops which I believe are completely untrue. Folks are citing the closure of Crown Colony Restaurant and the Garden Gate Cafe as signs of impending doom. I've dug into this and let me enlighten you, Crown Colony isn't closing, it's the table service area which is shutting down for the slow season. This happens every year folks, it's nothing new. It's been happening since Anheuser-Busch owned the parks, generally end of August through March this would close as it just wasn't needed. Also, Garden Gate Cafe is NOT closing, it's the Orang Cafe which is closing for the season. Personally I'd expect both of these to re-open about the time of spring break (late March-early April) and run through the spring/summer season once again. It's also out there that closure of the skyride is another sign but folks, this closes seasonally too. It's always closed during Howl-O-Scream season as it was once used as a haunt and sometimes the queue line is re-purposed for a haunt, plus the ride over the area sometimes gave away some of the haunts. Rhino Rally is another example, this ride is EXPENSIVE to operate and it's always been plagued with issues. I can't tell you if it's completely normal these days to see it closed during off-season but in the past it was fairly common. However, I admit it is closing a little earlier then normal. The other point is the $50 weekday passes. To me, if your not getting the numbers you want, this makes sense. Busch Gardens shouldn't have huge prices nor should Seaworld. Before Blackstone took over these parks never played much in the "price hike wars" which happen seasonally in Florida. Not only will a cheaper weekday ticket get the tourists in the door, your going to bring in more locals also. This goes hand in hand with cutting out their "late night" hours, which have been reduced. Now let me point out something, a park that is in "serious trouble" as some are saying, doesn't build new rides. Yet that's exactly what Busch Gardens Tampa is going. 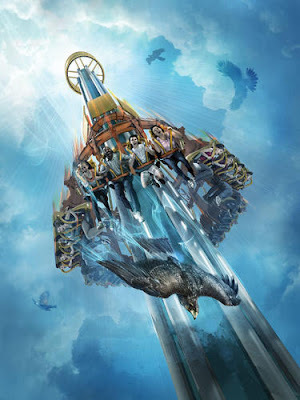 A new ride is coming in 2014 called "Falcons Fury" which is a unique take on a drop ride. Troubled parks don't build, they cut building projects. Nor do troubled parks work to re-open rides yet that's exactly what I've heard is going on with Gwazi. It wasn't operating at all for a time as the park was waiting on a vital ride part to be shipped in, I'm told it's now operating on at least one side. I can't honestly tell you the future of the ride as stated in my "The Gwazi Situation" post but for right now, it was repaired and one side is running. Blackstone may be tightening the reigns, that's obvious by some earlier-then-normal closures but I don't think the park is going into decline. Oh Boy, this is Doom and Gloom central. Now, I can see why some of this is being said but a lot of it is just plain nonsense. Let's begin with the closure of some attractions. The most obvious is "Europe in the Air" which is a film simulator type ride. This has never been something impressive and the attraction really hasn't had a line of any substance in years aside from the fact it's air-conditioned in the summer. This entire attraction has gone through 3 different versions, none of which stuck around very long. They just haven't been popular with tourists. Apparently it closed rather suddenly in July, this could be for two big reasons. The first is simple, it's broken or they've opted to remove it (which I wouldn't blame them for, it's dull). The second and most likely answer is the fact that the "Europe in the Air" queue and part of the building is used for a haunt during Howl-o-Scream. The next 'closure' is the Globe Theater which is simply being re-vamped for a new show. They are removing the 4D show and setting it up for live performance which does take time and some considerable effort to produce. The next point of contention is the live shows. Everyone (and I do mean EVERYONE) dislikes the entertainment director. I admit, his shows are pretty crappy and dull enough that even kids aren't amused by them. The "Entwined" show which is now in the Festhaus is enough to make your eyes cross. Top this off with rumors that none of the performers have had contract renewals and folks are being fired for anything at the drop of a hat, that doesn't look too good. Double that up with the new show going into the Globe theater and we all know what to avoid in favor of roller coasters. Personally, I don't see this as "Doom and Gloom" but Williamsburg always had excellent shows and it seems like this is a downhill sign.. at least until he gets booted. Frankly, I don't see "Imminent failure and closure' in these signs. I just don't, what I do see is budget cutting were is isn't going to hurt the parks in a massive way. Remember, we're not playing with Anheuser-Busch money anymore and we're playing with a company that isn't used to operating a proper theme park. They either learn it takes money to make money or they'll sell the parks to someone who has a clue what it takes to operate a proper theme park but I don't believe we'll see them fail in the least. Plus I don't believe that August Busch III would allow that to happen, unlike August Busch IV (aka "Junior" or "That Idiot") he loves the parks and was displeased about their sale.